Tube-Tech manufactures finned Cooling coils in various forms and shapes for direct applications in different types of heat exchangers. 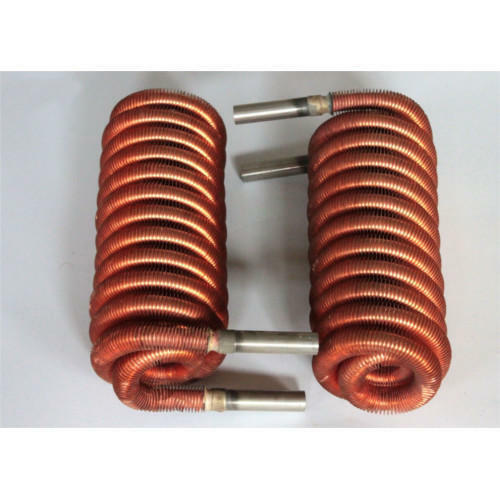 These cooling coils are manufactured mainly from Copper Tubes, Cupro Nickel Tubes and Stainless Steel Tube materials. Medium and High Fin Tubes are produced in Fin Density of 11 Fins per inch and Fin Depth of 2.5 mm and above in straight lengths. These finned tubes are then formed in the required shape generally helical to suit the Customer’s specific requirements. We also customize these cooling coils in our in house design facility as per the Customer’s requirements for different applications. These cooling coils exhibit high thermal conductivity and are compact in design and thus save cost and assembling space. These Finned Cooling Coils are available in 15.9 mm & 19.05 mm base tube diameter. These Finned Cooling Coils are available in single layer wound OR double-layer wound as per the requirement. Tube Tech Copper & Alloys Pvt. Ltd.
© Copyright 2008 - 2010. Tube Tech Copper & Alloys Pvt. Ltd.